Milwaukee collector Wim Leydes wants to tell the story of the Jewish Brigade and the Jewish Partisans who fought in WWII. Milwaukee collector Wim Leydes has documented the story of a woman who joined the Jewish Partisans. Lake Effect's Stephanie Lecci speaks with Vim Leydes and Steve Daily. A new exhibit opening today in Milwaukee, in time to commemorate the 70th anniversary of D-Day, is focusing on some lesser-known moments of valor during WWII. unique collection of WWII artifacts. Leydes hopes the pieces he's gathered help tell the story of the Jewish soldiers and civilians who fought against the Nazis. "There's this myth that...people were just led to the slaughter like sheep, that there was no resistance and the people just let themselves be taken away and be killed," he says. "The more I started researching it, it's like so absolutely not true. One thing I hope that people will get from this exhibit is that I want them to learn that not only did the Jewish people resist, but they actively fought back and they were actually very successful at it." 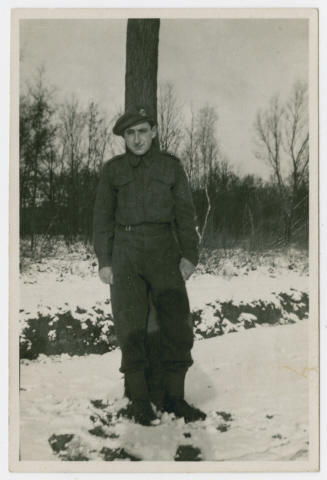 Leydes, also the author of My Jewish Journey, says most people know about the Warsaw ghetto uprising, but few know the story of the Jewish Brigade, a group of Jewish soldiers from Poland who joined up with the British army to fight against the Nazis. The brigade included Hersh Makowski, who now lives in Milwaukee. Now a resident of Milwaukee, Hersh Makowski fought with the Jewish Brigade in WWII. Other exhibit photos and documents from Leydes' collection tell the story of the Jewish Partisans, a guerilla resistance movement that took up arms against the Nazis. In particular, he shares the story of Faye Shulman, a young woman whose family was murdered along with most of her town by Nazi soldiers. She was spared by the Nazis for her photography skills, and she later was able to escape and joined up with the Partisans. Her photographs are some of the few documenting Partisan activities. Chudnow executive director Steve Daily says it was important for the museum to mark the D-Day anniversary given its exhibits are based on the collections of Milwaukee doctor Avrum Chudnow, who was both Jewish and a WWII veteran. Chudnow landed on Omaha Beach on the second day of D-Day, as part of the Port Battalion, which unloaded supplies for other soldiers. Daily says the exhibit honors the sacrifices made during WWII, and sharing Makowski's and Shulman's stories, as well as those of the rest of the Jewish fighters, fits in well with the museum's mission. "It's a way for the museum to talk about how one individual can change history," he says. "We feel that Mr. Chudnow's collection, his vast number of things that he saved, is a perfect example of how one person can make a difference. Well, Faye is another one of those people, that one person can make a difference." Leydes will be giving a lecture Friday night and on Thursday, June 12th. The Chudnow will also present WWII re-enactors Saturday morning and host a talk by Milwaukee WWII veteran and author Eugene Schulz on June 10th. On the 50th anniversary of the D-Day invasion, three Milwaukee area veterans reflected on the impact the day had on them then, and throughout their lives. Today on the 70th anniversary of the Allied invasion in France, we offer recollections of local men who landed in France on D-Day.